Purpose: The purpose of the study is to assess which dental hygiene program admission variables contribute to the selection of students who are successful in passing the National Board Dental Hygiene Examination (NBDHE) and a clinical dental hygiene board examination. Methods: A retrospective study was conducted by investigating 121 educational records and application forms from graduates through the years 2008 to 2011 from one educational institution. Predictor variables included re-application status, student GPA, age, race/ethnicity, type of school attended for pre-requisite coursework, number of times the pre-requisite courses needed to be retaken, course load while taking the pre-requisites, previous degrees obtained, American College Test (ACT) scores and student participation in the university's lower division (LD) or upper pre-placement (UPP) program. Graduate success is defined by NBDHE scores and clinical board scores. Results: The data was analyzed using univariate analyses and multivariate regression statistical techniques. Univariate analyses did not identify any predictor variables to be significantly associated with the dental hygiene student's clinical board score. However, the variables of ACT scores and type of student, specifically the UPP students, demonstrated a significant relationship with NBDHE scores. Conclusion: ACT scores are a variable that is positively associated with higher NBDHE results. Results indicate that UPP students benefit from participating in supportive educational services while fulfilling requirements for admissions in the dental hygiene program. Results also indicate that there were no significant variables identified to predict clinical board scores. Dental hygiene schools are faced with an ongoing challenge of selecting the most qualified students to fill a limited number of openings each year.1-5 If a program selects less qualified applicants, lower standardized clinical scores and an increased number of failures on the National Board Dental Hygiene (NBDHE) written board exam may result, ultimately leading to licensing barriers for the student.1,3-5 This problem may be prevented if the selection criteria utilized in the admissions process was able to predict future student success. While previous studies have investigated the admissions process and the success of dental hygiene students enrolled in the program,3-7 the majority of the literature focuses on the admissions processes utilized in dental schools.8-16 Dental hygiene programs cannot automatically assume that the successful admissions predictors of dental student performance correlate to the admission variables associated with dental hygiene student success. Entry-level dental hygiene students are undergraduates and the factors predicting success may be different for dental students enrolled in a graduate degree program. Thus, there may be inherent differences between these two sets of students. This study gathered student data from the baccalaureate degree dental hygiene program at the University of Louisville, School of Dentistry, in Louisville, Kentucky, to determine if there were any reliable predictors of student success in taking a clinical board examination or the NBDHE. A retrospective study was conducted of educational records and application forms of students who graduated from the dental hygiene program at the University of Louisville School of Dentistry, a traditional four-year university, between the years 2008 and 2011 (N=121). The researchers intentionally chose this four year range for the data collection since the NBDHE numeric scores were distributed during that period rather than the current NBDHE pass/fail reporting system. The study proposal was approved by the University of Louisville School of Dentistry Institutional Review Board. Predictor variables included both continuous covariates (age entering the program, overall GPA, science GPA, curriculum GPA, and ACT score) and categorical covariates (year of graduation, re-applicant status to the upper division program, race, previous higher education, course load, previous degrees, any retakes of dental hygiene pre-requisites, and type of student). Curriculum GPA consists of the GPA of all of the specific pre-requisite courses needed before applying to the upper division dental hygiene program. Categories of previous higher education were operationalized by specifying how much pre-requisite course work was done in a community college setting, a four-year university setting or a mixture between the two settings before applying to the upper division dental hygiene program. Students were classified according to how they entered the program by the following student types: an “outsider” was a student who transferred to the program from another institution or was a University of Louisville student who declared another major before applying to the upper division dental hygiene program; a lower division (LD) student was one who had attended the University of Louisville to obtain general education and program prerequisites; and an upper pre-placement (UPP) student was one who met the program acceptance criteria prior to the application deadline. To further clarify, LD students are students who have come to the university and declared dental hygiene as their major in their first or second year of college and UPP students are those who applied for early admission into the upper division dental hygiene program during their senior year in high school or following their first semester in college. To be eligible for UPP, students must have a minimum score of 25 on the ACT and must have a high school cumulative GPA of 3.3 or higher or have completed their first colle-giate semester with a cumulative 3.3 GPA and a 3.0 GPA average in specific sciences. All UPP students must successfully complete specific coursework to maintain admission into the upper division dental hygiene program. All statistical analyses were performed using the SPSS program, version 22. Descriptive summary statistics were generated for all variables and inferential statistics included univariate analyses and a multiple regression analysis. The alpha level was set at 0.05 to determine statistical significance. Admissions predictor variables that were significant or close to significant were entered into a multiple regression model to determine a relationship to the dependent variable (dental hygiene clinical board examination pass rates and NBDHE scores). Only the scores of the first attempt at a regional clinical board examination and NBDHE were included in the statistical analysis. In the univariate analysis, none of the predictor variables were significant for clinical board examination scores. This suggests that variables used in the admissions process are not indicators for passing clinical board examinations. However, there was one interesting result in the t-tests for the variables of re-applicant status and clinical board score. 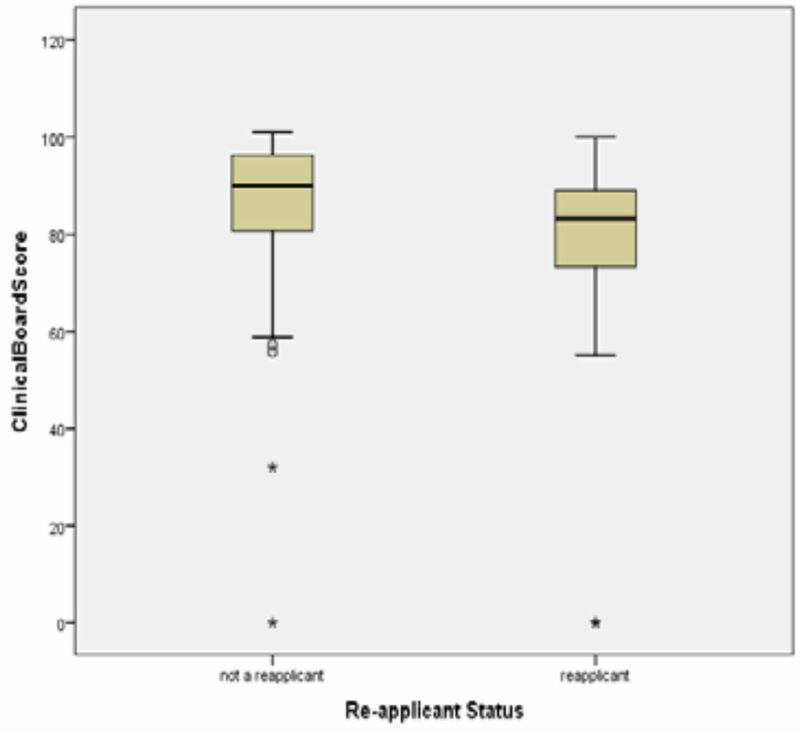 Boxplots (Figure 1) illustrate that re-applicants to the program tend to have lower clinical board scores than students accepted into the program on their first application. There was also a wider range of scores for the re-applicants as opposed to the first time applicants. The Wilcoxon test evaluated the difference of the means of clinical board scores for re-applicants and students who gained entry into the program on the first application, and was found to be significant (z = −2.356, p = .018). This indicates that the distribution of clinical board scores is different between re-applicants and first time applicants. However, univariate analysis did not indicate a significant finding for re-applicant status and clinical board examination scores. Univariate analysis of ACT scores (F = 11.749, p = 0.001) and curriculum GPA (t = 2.104, p = 0.038) was found to be statistically significant. However, ACT score submission was not a program requirement for applicants during the time period that the data was collected. Further t-tests revealed that there was not a significant difference on student NBDHE scores (t = −.102, p = 0.920) between applicants who reported ACT scores on their official transcripts (n = 83) versus applicants who did not include their ACT scores (n = 38). 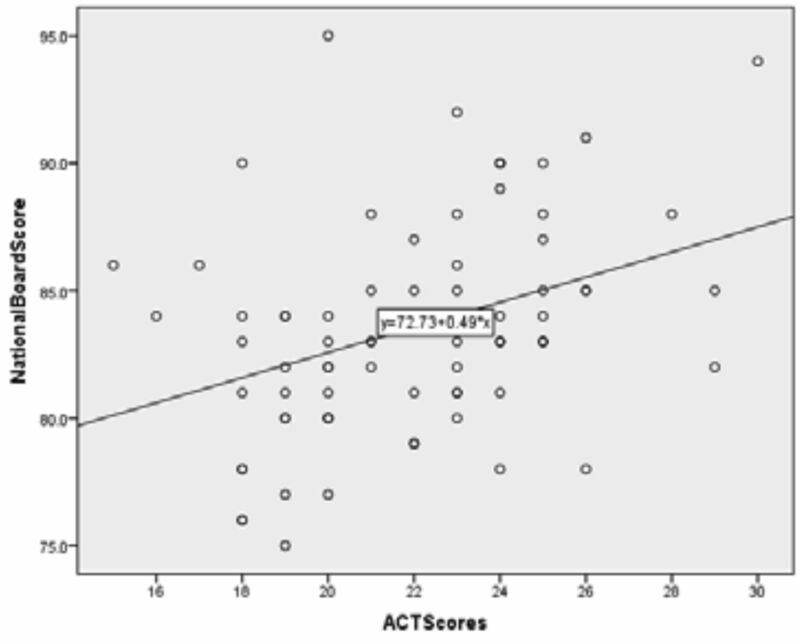 The scatterplot (Figure 2) illustrates that for every point increase in ACT scores, there is a half point gain in NBDHE scores. A multivariate regression was performed to see which predictor variables impacted NBDHE scores. The r2 results suggest that approximately 22% of the total variance of NBDHE scores can be explained by the admissions and demographic variables gathered in this study. The overall regression analysis was statistically significant (F = 4.096, p = 0.003) indicating that there are some predictor variables related to NBDHE outcomes. Specifically, ACT scores (b=0.512, p < .001) and the UPP student status (b=−3.654, p < .01) had a significant relationship to the NBDHE scores (Table II). Applicants with higher ACT scores demonstrated better performance on the NBDHE. UPP students performed slightly worse than LD students or students described as “outsiders” to the program. The purpose of this study was to determine whether any admissions variables or student demographic variables have a significant relationship on clinical board examination scores and/or NBDHE scores for dental hygiene students in one particular program. Overall, the univariate analyses were not statistically significant in predicting dental hygiene clinical board examination results, which was similar to the findings in the research conducted by Sanderson and Lorentzen.6 Univariate analyses indicated that ACT scores and curriculum GPA from college coursework had an effect on NBDHE exams when those variables were isolated. As indicated by previous studies regarding admissions into dental and dental hygiene schools and ACT scores,3,5 the multiple regression analysis using NBDHE scores as a dependent variable in this study, found that the ACT score has a significant positive relationship with the NBDHE scores. Therefore, students with higher ACT scores are more likely to perform well on the NBDHE. Scatterplots and regression equations indicate that for every point higher on the ACT, students are likely to do about a half a point better on the NDBHE. Therefore, this finding suggests that there may be a 5 point difference on NBDHE scores between those students who scored a 20 and those students who scored a 30 on their ACT. Curriculum GPA was not statistically significant in the multivariate analysis. Another finding is that the type of student impacted NBDHE scores. The University of Louisville has developed specific programs and services to help acclimate students to the university setting with the intent of assisting a successful transition to their selected majors and ultimately graduation from their chosen discipline. These services include academic support for LD dental hygiene majors and UPP students with pre-requisite courses prior to application to the upper division dental hygiene program. Participation in the academic support services was optional for the LD and UPP students. Recently, a living learning community has been added to provide additional structure and student support. However, any impact of this added service is not reflected in our data. These findings also suggest that “outside” students, coming from another institution or another major within our university, who did not have the option to participate in these support services, performed better overall on the NBDHE when compared to the UPP students. The difference between the “outsiders” and the LD student NBDHE scores or between the LD students and UPP students was not statistically significant. However, caution needs to be taken when interpreting these results due to the fact that the LD and UPP programs were relatively new during the time period studied and students were not required to participate in the academic support services. Thus, there could be a bias between the LD or UPP students who received additional academic supportive services and those who choose not to participate. Since the UPP students traditionally performed well academically in high school, one can speculate that they may have declined the additional support services due to confidence in their academic abilities and knowledge of their early acceptance in the upper division dental hygiene program. Unfortunately, data had not been collected to track students who accessed services and those who did not during the time period studied. Since these programs were initiated, new mandatory support services have been developed and there is potential for future research on the impact of these required student support services. There are several limitations in this study that may have influenced the results. First, this is a single institution study and therefore the results cannot be generalized to other dental hygiene programs due to variations in admissions criteria, curriculum sequence, program length, and terminal degree granted. Findings from this study suggest value in further research at other universities or schools. Secondly, the date range in this retrospective study is also limited due to the fact that students no longer receive numeric score on the NBDHE. As such, it is harder to determine which admissions variables are better predictors of student success. There are a limited number of studies examining other potential variables, such as race, previous higher education, course load, and type of student, which may also influence dental hygiene student success. This is an area for potential future research. Additional research is needed to identify potential predictors of student success on clinical board examinations; as programs with high clinical board examination scores and subsequent pass rates, may elevate the program's prestige in the surrounding dental community. Future research also needs to investigate the impact of reapplying to dental hygiene programs on future success in the program, as this was an interesting trend observed in this particular study. The role of the student support services prior to program admission and their impact on student performance and board examination outcomes is another area of interest for future research. Students who are better prepared academically, as indicated by their performance on the ACT standardized test prior to admission in the dental hygiene program, will more likely score higher and pass a written board examination (NBDHE). However, it is not evident whether any variable currently in use is a reliable predictor of future success on a clinical board examination. Jennifer O.Rudy, RDH, MA is an Assistant Professor; Jaqueline A. Singleton, RDH, PhD is an Associate Professor and Program Director; Linda Hart Lewis, RDH, MEd, is Professor Emeritus all from the Department of Oral Health and Rehabilitation at the University of Louisville School of Dentistry, Louisville, Kentucky. Predictors of success in dental hygiene education: a follow-up study. J Dent Hyg. 2010 Winter;84(1):24-28. Predicting academic and National Board Dental Hygiene Examination performance based on academic factors. J Dent Hyg. 2004 Winter;78(1):39-45. Admission indicators of failure on the National Board Dental Hygiene Examination. J Dent Educ. 2008;72(5)210. Predictors of student success in an entry-level baccalaureate dental hygiene program. J Dent Hyg. 2007 Spring;81(2):13p. Predicting national dental hygiene board examination success based on specific admission factors. J Dent Hyg. 2011 Fall;85(4):335-339. Exploring Preadmission Criteria as Predictors for Dental Hygiene Licensure Examinations Pass Rates. J Dent Hyg. 2015 Apr;89(2):101-108. Effect of grade point average and enrollment in a dental hygiene national board review course on student performance on the National Board Examination. J Dent Educ. 2004 Jan;68(1):77-80. Correlation of admissions criteria with academic performance in dental students. J Dent Educ. 2007 Oct;71(10):1314-1321. The admission index in the dental school admissions process. J Dent Educ. 1982 Aug;46(8):500-503. Analyzing the influence of admissions criteria and cultural norms on success in an international dental studies program. J Dent Educ. 2008 Mar;72(3):317-328. Creating an evidence-based admissions formula for a new dental school:university of Nevada, Las Vegas, school of dental medicine. J Dent Educ. 2007 Apr;71(4):492-500. Preprofessional grades and the dental aptitude test as predictors of student performance in dental school. J Dent Educ. 1968 Dec;32(4):452-457. Prediction of success in dental school. J Dent Educ. 1968 Jun;32(2):161-170. Grade averages and DAT scores as predictors of performance in dental school. J Dent Educ. 1979 Nov;43(12):630-632. Correlation of admission criteria with dental school performance and attrition. J Dent Educ. 2002 Mar;66(3):385-392. Predicting performance in Canadian dental schools: the new CDA structured interview, a new personality assessment, and the DAT. J Dent Educ. 2007 May;71(5):664-676. Predicting achievement in dental school. J Dent Educ. 1963 Aug;27:148-155. Aptitude and personality correlates of dental school performance. J Dent Educ. 1969 Dec;33(4):474-486. Associations among predental credentials and measures of dental school achievement. J Dent Educ. 2008 Feb;72(2):142-152. Predicting academic performance and clinical competency for international dental Students: seeking the most efficient and effective measures. J Dent Educ. 2005 Feb;69(2):270-280. Assessment and evaluation of individual prerequisites for dental education. Eur J Dent Educ. 2004 Nov;8(4):152-160. Increasing dental hygiene student diversity: life-performance questions as alternative admissions criteria. J Allied Health 2003 Winter;32(4):279-284. Variables predicting students' first semester achievement in a graduate-entry dental school in korea. J Dent Educ. 2007 Apr;71(4):550-556.